I was living in Shanghai two years ago when two of my friends from New York came to visit. It was their first visit to China and everything was novel. On the evening of their arrival I took them to the rooftop terrace at a café called New Heights. We had a few drinks and watched the “light show” on the buildings across the river in Pudong. We then headed to dinner at Jade Garden, a Shanghainese restaurant, where I ordered braised bran dough (烤麩). You see my friends are rather well informed when it comes to dining, and rightly so because they frequently venture into New York’s many ethnic restaurants and travel extensively overseas. But they had never heard of bran dough and found it a rather curious dish. It contained tiny pieces of sponge-like dough braised in soy sauce and other ingredients. They weren’t quite sure what to expect initially, but I was confident it would be love at first bite. I was not wrong. Ask any Shanghainese about their favorite appetizer and chances are they will mention bran dough. But what the heck is bran dough? You ask. Well, even most Shanghai natives are at a lost for how to explain this very Shanghainese food ingredient to foreigners. It looks like bread yet has a mild tofu-like flavor. Indeed many people mistake it as a soy product. But it is really a type of gluten product and is originally from Shanghai. Similar to seitan the dough is made from wheat gluten with bran added for extra texture. Yeast is also added to raise the dough, which is steamed into a spongy cake before being sold in blocks. There are many ways to prepare bran dough but it is almost always cooked in a braising liquid that flavors the dough. The best know preparation is called Four Happiness Bran Dough (四喜烤麩). 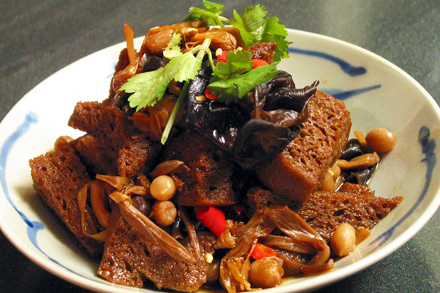 The four happiness in this dish traditionally refers to wood ear mushrooms, dried lily flower buds, peanuts and bamboo shoots. But many recipes interpret them differently. 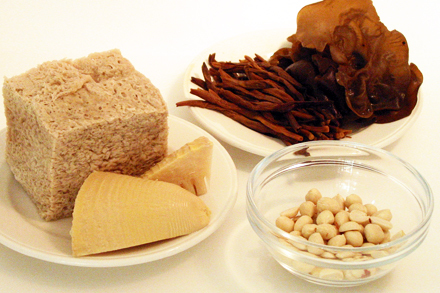 Some call for dried shiitake mushrooms, daikon radishes, carrots or lotus seeds. Personally I prefer the traditional list. The ingredients are cooked together in a rich soy sauce braising liquid. It is usually served at room temperature dressed with sesame oil. 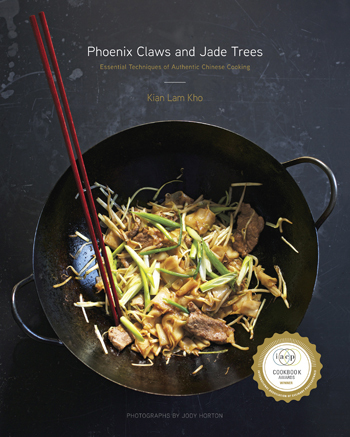 The dish tastes slightly sweet and full of earthy flavors from the wood ear mushrooms and lily flower buds. It definitely makes an excellent appetizer before a grand meal. In China bran dough is sold fresh in blocks. They can be found in the refrigerated section near the tofu products. For years only the dried version was available in America. Recently, however, I’ve been able to obtain them fresh in Chinatown markets. One brand is made locally in Queens and others imported from China. Last week I invited the two friends, who visited me in Shanghai, for dinner. I served Four Happiness Bran Dough made from the recipe below. I finish the dish with extra chili oil and chopped pickled chili because they both love spicy Chinese food. Apparently this was the first time they’ve eaten bran dough in America. They were delighted because they have been searching for bran dough in every Chinese restaurant they visited ever since returning from China. 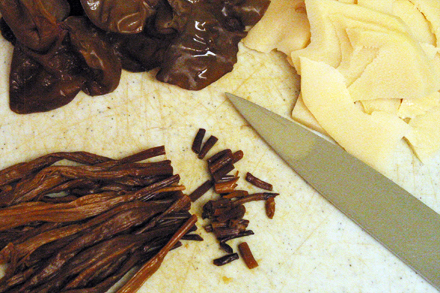 Reconstitute the wood ear mushrooms and lily flower buds together in 1/2 cup of very hot water. Let sit for 15 minutes until it is cool. Boil the peanuts in about 1/2 cup of water for about 10 minutes. Drain well and set aside. Cut the bamboo shoots into 1/16 inch thick slices and tear the bran dough into chunks of about 3/4 inch wide. Drain the wood ear mushrooms and lily flower buds, and reserve the liquid. Trim off the stem ends of the lily flower buds and the root part of the wood ear mushrooms. They tend to be quite tough otherwise. In a wok or a medium saucepan put the bran dough, peanuts, bamboo shoots and the reserved liquid from reconstituting the mushrooms and lily buds, as well as all the liquid ingredients except for the sesame oil. Cook for about 20 minutes on medium heat until the liquid has been absorbed into the bran dough. Add the wood ear mushrooms and lily flower buds and continue to cook for another 10 minutes. Remove from heat and let cool. Serve at room temperature. Just before serving pour the sesame oil over the dish and garnish with chopped scallions and cilantro. Oh wow, thanks for the recipe and the explanation. I’ve never heard of this, but I’m excited to see if I can find fresh bran dough in Boston. It looks so good! This looks so interesting! It’s something I have never seen before but now I am going to keep an eye out for it in restaurants and Asian markets. I never was a big fan of seitan in my vegetarian days but the Shanghai flavors and the added bran make this sound so appealing. Now I have a new ingredient to look for at the Asian grocery! Very cool – thanks for sharing!! Don’t think I’ve ever had bran dough before… but now that you mentioned it, I think I’ll def give it a try! Betsy, There are two major categories of Chinese alcohol beverage. Both made from grains and they are known as yellow and white wine. Yellow wine (Huangjiu) is the kind that Shaoxing (a city in Zhejiang province) is very well known for. There is a wide range of quality grades in Shaoxing wine. But the lower grade wine is commonly used for cooking. They usually only cost about $3 or $4 in Chinatown. Good quality Shaoxing wine can be very smooth and has a slightly sweet taste. Almost like a good dry sherry. They can also cost hundreds of dollars a bottle for the 25 years or 30 years aged wine. White wine (Baijiu) on the other hand really is not “wine” in that it is distilled and should be considered liquor. It has very high alcoholic content and can really be brutal for those not accustomed. I do not know the about the extra salt type you referred. So I would not advise you to use that. If you can’t get the Shaoxing cooking wine you can replace it with regular dry sherry. I love seitan as well as use bran regularly in my recipes, so I’ll definitely be looking for it at my local Asian supermarket! I’ve had this, but never had any idea what it was made of. Isn’t it usually called “mock [insert name of meat]” in Buddhist vegetarian restaurants? I feel like there’s some kind of Marlon pun waiting to be made with the name of this dish. Michele, The mock meats you mentioned are variations of seitan. So is this “bran dough.” The only difference is the added bran flour. You know in fact some manufacturers simply make it with only seitan (or wheat gluten) and no bran.